The Hunter's Moon highlights the sky tonight. In most years the Harvest Moon comes in September, with the Hunter's Moon in October. But this year October's full Moon was closer to the fall equinox, so both the Harvest and Hunter's moons were pushed back a month. Lovely Moon Pam - meant to ask - is thee a special date for this Hunter's Moon, like it lasts only one day? Thanks, Maree. As far as I know it's the November full moon. It looks like there might me another toward the end of the month so who knows :) The Farmer's Almanac says this moon is also called the Beaver Moon or sometimes referred to as the Frosty moon. These names date back to Native Americans, of what is now the northern and eastern US. Pam, so good to hear from you. I get so happy to see what you are up to. I love that you have so many workshops lined up, the daisies and ducks are great. Health continues to be a challenge, now I have pneumonia but feeling much better. No temp today. The beat goes on!!! You keep up all this great work. Enjoy your time with hubby sitting watching those ducks. Every day is precious. Judy, so good to hear from you!! Truer words were never spoken! Let me know if you got my email re: blue crab note cards. 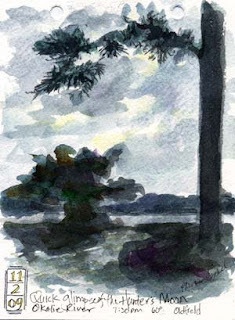 Beautiful sketch Pam - truly captures a moonlit evening around here! Thanks, Dave. Good to hear from you.